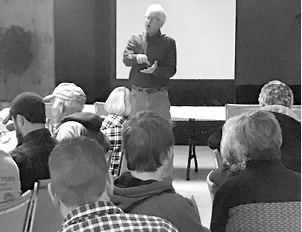 On Tuesday, January 22, the Twin Lakes Cattle Association of Clinton County held its first quarterly meeting of 2019. The meeting was held at the First United Methodist Church in Albany. The activities kicked off with a chili and sandwich meal that was sponsored by Burkmann Feeds of Glasgow, Kentu cky. Dr. Charles Townsend, DVM, of Burkmann Feeds gave an enlightening talk to the membership speaking on pre-breeding vaccinations and other factors that can affect conception rates. Doug Wilson, of the Kentucky Division of Conservation, followed with an overview explaining the importance of Water Quality plans and role it plays in livestock producer operations. He also explained to the group the various cost share programs that are available to producers in Kentucky and where to sign-up for these. Colby Guffey, Ag agent for the UK Extension Service in Clinton County, updated the group on the current CAIP program deadlines for 2019. He also discussed the possibility of getting together a group of local producers to visit the Eden Shale facility later this spring. President Steve Peddicord talked to the members about the benefits and advantages of commercial producers using crossbreeding in their operations to maximize profit and maternal benefits. The next quarterly meeting will be held on April 23, 2019. Anyone who would like to become a new member for this year is encouraged to stop by the Albany Animal Clinic and Dr. Charles Daily will gladly sign them up. Till next time, keep putting on the pounds! Steve Peddicord, President of the Twin Lakes Cattle Association is shown speaking to the membership about the benefits of crossbreeding in commercial operations.